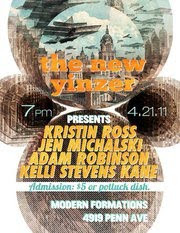 I'm excited to be reading in Pittsburgh again this Thursday, especially with Kelli Stevens Kane, Adam Robinson, and Kristin Ross! Thanks to Karen Lillis and the great folks at the New Yinzer for having us. I might read an excerpt from the novel if I can find a short, self-contained one. Excited that it's almost finished. At any rate, I need to finish this novel quickly because I've got this other one knocking around in my head and it's going to kill me if I don't start it soon. Courtesy of Tylenol PM, I slept through the night for the first time in literally years. I'm always afraid to take it because my dreams are so wild on sleep aids, even wilder than normal. And I don't like the loss of control that comes with taking sedative-like medications. But I somehow pulled a muscle or had a cramp deep in the middle of my right quad, a feeling like the bone would snap in two, and needed the convalescence. The dreams weren't so bad after all. I remember trying to play the solo for Metallica's "And Justice for All" on a lilac-stained acoustic guitar. I was in my high school biology teacher's lab, and it was so hot. My brother was there. My friend W. moved again to San Francisco. I was at the beach, the surf inky with light powdery froth. For some reason, I woke up thinking of T.S. Eliot's "The Wasteland." I have a couple of stories forthcoming in great journals—Used Furniture Review, Bananafish, The Northville Review. You should definitely read these magazines and submit to them. I wish we had more time in Pittsburgh than we do, but Easter's this weekend, so we have to get home since the family is coming. Not even time to eat a Primanti Brothers sandwich, I fear. And Falling Waters? Definitely our next trip. But that monstrous truck stop with cheesy gift shops east of Pittsburgh as you leave Maryland? Oh God, yes.